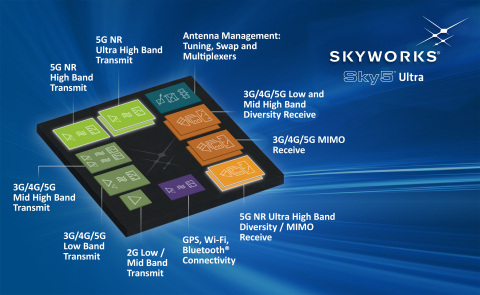 Skyworks Unveils Breakthrough Sky5™ Ultra Platform | Skyworks Solutions, Inc.
BARCELONA, Spain--(BUSINESS WIRE)--Feb. 25, 2019-- Skyworks Solutions, Inc. (NASDAQ: SWKS), an innovator of high performance analog semiconductors connecting people, places and things, today launched its most advanced 5G cellular architecture yet, the Sky5™ Ultra. Leveraging decades of systems expertise, Skyworks has developed a fully integrated, baseband agnostic solution that combines all of the critical front-end functionality required to enable high performance 5G mobile devices with global coverage in an exceptionally compact form factor. The world’s most comprehensive platform features best-in-class transmit and receive capabilities with unprecedented efficiency and output power, enabling highly reliable network connections while optimizing battery life—both critical for 5G applications. In addition, the Sky5™ Ultra leverages DSBGA packaging, dramatically reducing the footprint, and advanced TC-SAW and BAW filtering, uniquely providing the best performance at each targeted frequency band. The solution also supports up to 100 MHz wide bandwidth, maximizing data throughput at ultra-fast speeds. 5G rollouts have already begun and will continue to ramp over the next few years. According to the Global Mobile Suppliers Association, 11 worldwide operators have announced limited 5G service launches and seven additional operators have turned on 5G base stations, with commercial services to follow. For more information about Sky5™ Ultra and our comprehensive Sky5™ portfolio, visit www.skyworksinc.com/Products_Sky5 or contact Sky5@skyworksinc.com.